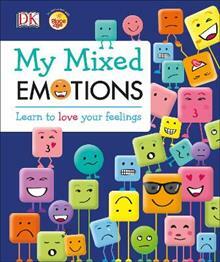 Learn all about emotions with this friendly guide, packed with advice on how to understand your feelings.Feelings can be tricky, and My Mixed Emotions will coach you through situations including dealing with bullying, getting on with siblings, grief, relaxing, dealing with sadnes... read full description below. Learn all about emotions with this friendly guide, packed with advice on how to understand your feelings.Feelings can be tricky, and My Mixed Emotions will coach you through situations including dealing with bullying, getting on with siblings, grief, relaxing, dealing with sadness, and how to cope if your family splits up. Discover great things about yourself, and understand why you laugh when you hear a joke, why you cry when you watch a sad film, what a smile is, why the dark can be scary, why you blush when you're embarrassed, and why sometimes you can feel lots of different emotions all at once! Fun emojis will explain phobias, give you new vocabulary to describe your emotions, and show you what a special person you are. My Mixed Emotions will become your friend and guide as you travel through the mixed-up world of emotions to discover your wonderful, unique self.